Introducing the basic concepts in total program control of the intelligent agents and machines, Intelligent Internet Knowledge Networks explores the design and architecture of information systems that include and emphasize the interactive role of modern computer/communication systems and human beings. Here, you’ll discover specific network configurations that sense environments, presented through case studies of IT platforms, electrical governments, medical networks, and educational networks. SYED V. AHAMED, PhD, DSc, MBA, is Professor of Computer Science at The City University of New York (CUNY), College of Staten Island and Graduate Center, and Professor of Medical Informatics at the University of Medicine and Dentistry of New Jersey. Coauthor of five books, Dr. Ahamed's research focuses on specialty telecommunications, IT, MIS, knowledge processing, and intelligent, medical, and educational networks. Dr. Ahamed holds more than twenty U.S. and European patents. PART I HUMAN THOUGHT AND MACHINE PROCESS. Chapter 1 Processing of Knowledge. 1.2 The Basis of New Machines. 1.6 Special Purpose Computer Systems. 2.2.3 Fiber Optics in Networks. 2.3 Transmission in Optical Network. 2.7 Expectations from Modern Network. 2.7.2 Special-Purpose LANs and Generic Backbones. 2.8.3 Integrated Network Architectures and Internet. Control and Sequencing of Functions. Communication of Data and Control Signals. Computation, Address Lookup and Dynamic Routing. 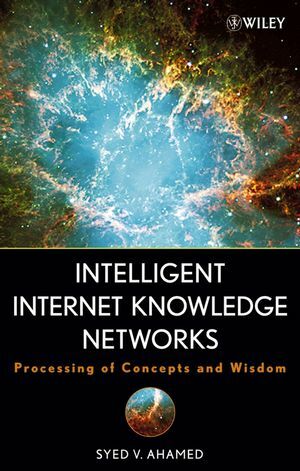 2.9.2 Specific Building Blocks of Intelligent Networks. 2.9.2.1 Service Switching Point (SSP). 2.9.2.2 Service Control Point (SCP). 2.9.2.3 Signal Transfer Point (STP). 2.9.2.4 Service Management System (SMS). 2.9.2.7 Functionality of IN Components. 2.10.1 Data Management in Intelligent Networks. 2.10.2 Data Management for DSL Development. 2.10.3 Data Management for Lightwave Systems. 2.10.3.1 Vendor Databases for Lightwave Systems. 2.1 0.3.2 Program Databases for Lightwave Systems. 3.1.2 Intelligent Internet from Intelligent Network Platform. 3.3.4.1 Integration of Medical Networks. 3.3.4.2 Status Quo of the Medical Network Environments. 3.3.4.3 Intelligent Medical Network or MSP-based Intelligent Internet. 3.3.4.4 Proposed MSP Network Configuration. 3.3.4.5 MSP-Based Network or the Internet. 3.3.4.6 Knowledge-Based Programmable MSP Architectures. 3.4.1 Network-Based Intelligent Educational Networks. 3.4.2 Network Architecture for Distance Learning. 3.4.3 Design Considerations of Network-based Educational Systems. 3.4.4 Features Common to Educational Environments. 3.4.5 Role of Networks in Educational Environments. 3.4.6 Role of Knowledge Bases in Educational Environments. 3.5 Architecture for Electronic Government. 3.5.1 Control, Coordination, and Flow of Information. 3.5.2 Configuration of an EG Platform for a Small Nation. 3.6.1 Interoperability of Databases and Data Formats. 3.6.3 Other Market Demands and Their Influence on Telco Databases. PART I1 STABILITY OF ENVIRONMENTS. Chapter 4 Sensing and Monitoring Networks. 4.1 Basic Concepts for Sensing. 4.2 Users, Intelligence, and Databases. 4.2.1 Network Segment Dealing with User Dialogue. 4.2.2 Network Segment Dealing with Knowledge and Intelligence. 4.2.3 Network Segment Dealing with Databases and Data Management. 4.3 Details of Flow of Information. 4.4 Deployment of Switch Architecture. 4.5 Adjunct Processes in the Switches. Chapter 5 Intelligent Knowledge Sharing. 5.2 KBs for Technology Transfer. 5.3.1 IN and KSP-Based Intelligent Internet. 5.3.2 Proposed Technology Transfer Network. 5.3.3 Merits of KSP-Based Network. 5.3.4 Programmable KSP-Based Network Architectures. 5.4 KBs in Hospital Networks. 5.4.1 Global Medical Network Environment. 5.4.3 Configurations of the Machine. 5.4.3.1 Level I-Routine Medical Functions. 5.4.3.2 Level 11-Machine Assisted Human Functions. 5.4.3.3 Level 111-Expert Medical Functions. 5.5.1 Intelligent Networks for Telemetry and Data Processing. 5.5.2 A Confluence of Four Disciplines. 5.5.4 The Architecture Dealing with Sensors, Intelligence and Databases. 5.5.5 Program and Data Management in the KPS. Chapter 6 Intelligent Control Systems. 6.2 Sensed Parameters as "Objects". 6.3 Deployment of Intelligent Control. 6.3.1 Sensing Network Response Complex Via the Sensors. 6.3.2 Configuration of the Transaction Management Machine (TMM). 6.3.3 Functions of the Database Management Machine (DBM). 6.3.4 Functions of DBM and KMM, Specific to Inventory Control. 6.4 Control of a National Economy. 6.4.1 Sensing Network Response Complex Via the Sensors. 6.4.2 Configuration of the Transaction Management Machine (TMM). 6.4.3 Interaction with Knowledge Management Machine (KMM). 6.4.4 Functions of DBM to Monitor National Economy. 6.4.5 Functions of KMM to Monitor National Economy. 6.5 Sensing Network to Replace Middle Management of a Corporation. 6.5.1 Flowchart of Events for Routine Activity. Chapter 7 Audio-Visual Sensing in Humans. 7.1 The Human Ear as the Processor. 7.2 'The Rules of Audio Language. 7.2.2 Audio Language for the Language Learners. 7.2.3 A Programmable Audio and Visual Menu for Every User. 7.3 Computer and Audio-Visual Languages. PART I11 HUMAN THOUGHT AND MACHINE PROCESS. Chapters 8 Framework for Processing Knowledge. 8.1.1 Conventional Processing from Computing Systems. 8.1.2 Call Processing from Telecommunication Systems. 8.1.2.1 Earlier Configurations of Channel Banks. 8.1.3 Knowledge Service Processing from Intelligent Networks. 8.1.3.2 Knowledge Transfer Points (KTP) for Knowledge Environments. 8.1.3.3 Knowledge Control Points (KCP) for Knowledge Environments. 8.1.3.4 Knowledge Services Control Points (KSCPs) for Knowledge Environments. 8.2 Platform of KPS from Computer Systems and ESS. 8.2.1 Communication Module (CM) of KPS. 8.2.2 Switching Module (SM) of the KPS. 8.2.3 Administrative Module (AM) of the KPS. 8.2.4 Knowledge Module (KM) of the KPS. 8.3 Role of the Knowledge Processor Unit (KPU). 8.5 A Multifunctional Intelligent Network. 8.6 Certainty in Knowledge Processing. 8.6.1 Knowledge Processing System Based on Uncertainty. 8.6.2.2 Knowledge Processor Unit (KPU). 8.6.2.3 Numerical Processor Unit (NPU). 8.6.3 Block Diagram of the KPS. 8.6.4.1 "Fetch" of KPU Instruction. 8.6.4.2 The "Decode" of KPU Instruction. 8.6.4.3 "Object Operand Fetch" of KPU Instruction. 8.6.4.4 The "Execute" of KPU Instruction. 8.6.5.5 "Store" the Result of KPU Instruction. 8.6.6 DBU and Its Functionality. 8.6.8 Fuzzy Hamming Distance and Its Iterative Control. 8.6.9 Design and Implementation of the System. 8.6.10 Program Execution Mode of the KPU. 8.6.10.1 Execution Sequence for External "Object" Programs. 8.6.10.2 Execution Sequence for Internally Generated Programs. 8.6.1 1 Learning Mode of the KPU. 8.6.12 Program Execution Sequence in the Learning Mode. Chapter 9 A New Breed Of Machines. 9.2 Human Needs and Computer Solutions. 9.3 Development of Machine Instructions. 9.3.1 Human Needs and Computer Languages. 9.3.2 Simple Needs, Simple Solutions. 9.3.3 Complex Needs, Complex Solutions. Chapter 10 Concepts and Constructs for a Wisdom Machine (WM). 10.2 Role of Decision Support Systems (DSS). 10.2.3 Scientific, Social and Mathematical Models. 10.3 Role of Sensing Networks. 10.3.3 Knowledge, Information, and Models Databases. 10.4 Role of Accumulated Knowledge. 10.5 Confidence in the Results. 10.6 The Realm of Reality. 10.7 Typical Computer Functions in the WM. 10.7.1 Dialog Processor (Subsystem 1). 10.7.2 Database (DB) Administrator (Subsystem 2). 10.7.3 Knowledge Base (KB) Administrator (Subsystem 3). 10.8.1 Symbols and Equations (Subsystem 4). 10.8.2 Axiomatic Tools (Subsystem 5). 10.8.3 Hypothesis Testing (Subsystem 6). 10.1 1 Frontier of Intelligence into Wisdom. 10.12 Order, Awareness, and Search. 1 1.2.2 Functions of the C&C Checker. 11.2.3 Role of Switching Systems. 1 1.3 Knowledge Communication Systems (KCSS). 1 1.3.1 Communication Module of KCS. 1 1.3.2 Switching Module of KCS. 1 1.3.3 Administrative Module of the KCS. 1 1.3.4 Intelligent Network Aspects in KCS. 11.3.5 Khowledge Control Points in KCS. 1 1.4 Knowledge Processing Systems (KPSs). 1 1.4.1 Programmable Steps for KPU. 1 1.4.2 Computer Processor Environments. 1 1.4.4 Low-Level Single KCPU Knowledge Machine. 1 1.4.5 Multiple KCPU Knowledge Machine. 1 1.4.6 Object-Based Knowledge Machine. 1 1.5 IN and IK-Based KPS (I2-KPS). 1 1.6 IN and IN-Based, Intelligent KPS (I3-KPS). 1 1.7 Wafer Level Knowledge Machines. 11.7.1 Object Processes and Knowledge Processes. 1 1.7.2 KOP Specific Processor Arrays. 11.7.4 Advanced Knowledge Processing Unit. 1 1.7.5 Wafer Level Knowledge Machine. Chapter 12 Wealth of Knowledge. 12.2 Truisms in Information Domain. 12.6 Integration and Social Change. 12.7.1 Algebraic Constructs of Knowledge Theory. 12.7.2 Systemic Limitations of Knowledge Systems. 12.9.1 Diminishing Value of Knowledge. 12.9.2 Economic Life of Inventions. 12.9.3 Impact of High-speed Networks on Human Behavior . PART IV PERSISTENT MINDS AND TIRELESS MACHINES. Chapter 13 Human Needs and Machines. 13.1.1 An Imitation of Human Behavior? 13.2 Inadequacy of Earlier Models. 13.3 The Need to Search (Sixth Level). 13.4 The Need to Unify (Seventh Level). 13.5 A Model of Human Behavior. 13.5.2 Repetition and Boredom at (6). 13.5.3 The New Cycle (1-6) for (i + 1)st Need. 13.5.4 Integrated Patterns for (1-7) Needs. 13.5.5 The Semi-infinite Search Space at Each Level. 13.6 Movement within Pattern (1-9) for Any One Need. 13.8 Effects of Phasors on Pattern (1-9) of Behavior. Chapter 14 The Practice of Wisdom. 14.2 The Sources of Wisdom. 14.3 Viruses in Human Networks. 14.4 Peripheral Accomplices in Human Networks. 14.6 Modules of Positive Wisdom. 14.6.1 Positive Predisposition of the Human Team. 14.6.1.1 Type A: Individuals Favoring Unrestrained Wisdom. 14.6.1.1 Type B: Individuals Favoring Restrained Wisdom. 14.6.2 Realizations of the Axioms of Positive Wisdom. 14.6.3 Flavors of Positive Wisdom. 14.6.4 Symphony of Positive Wisdom. 14.7 Modules of Negative Wisdom. 14.7.1 Negative Predisposition of the Abuser Team. 14.7.1.1 Type C: War Mongers Favoring Maximal Injury and Destruction. 14.7.1.2 Type D: Thugs Favoring Local and Controlled Injury. 14.7.2 (Derivations of) Statements of Negative Wisdom. 14.7.3 Flavors of Negative Wisdom. 14.7.4 Chaos and Fractals of Negative Wisdom. 14.7.5 Positive and Negative Modes of Wisdom. 14.8.1 Wisdom Base Management (WBM). 14.9 The Economics of IK&W. 14.9.1 The (Shortened) IKWV Chain. Chapter 15 Looking Ahead: Social and Ethical Implications. 15.1.1 Flexible Representation of Objects. 15.1.2 Object Processing Along the Knowledge Trail. 15.2.1 Economic Basis of Human Search. 15.2.2 Conflictive Directions of Human Role. 15.3 Human Discretion: Prophets or Plunderers. 15.3.1 Human, Still the Unknown. 15.3.2 Machine, Still the Mindless. 15.4 A New BDI-K-CWE Trail. 15.4.1 A Simplified Graph Representation. 15.4.2 Movement from Node (i) to Node (i + 1). 15.4.3 Charting of the Knowledge Trail. 15.5 From Bits to Etiquette. 15.6 Migration of Societies under External Influence. 15.6.2 Discrete Event Analysis and PERT. List ofAcronyms for the Entire Book.